Steven Oh, Global Head of Credit and Fixed Income for PineBridge Investments, discusses why investors should choose fixed income in the current environment, where he sees value in credit and his outlook on the sector. With the concerns around the volatility flashpoint that we saw toward the end of 2018 and the rebound in 2019, investors are asking questions relating to their credit exposure and the risk profile within their portfolios; however, we believe that if one focuses on the fundamental outlook, the credit environment remains quite supported in both developed and emerging markets overall. It is true that economic growth has peaked and is expected to slow down and in the same manner as our earnings growth. However, one of the key factors that continues to support the climate for credit returns is the fact that the central banks, primarily the Fed along with the ECB, have turned decidedly more dovish with respect to their interest rate expectations and their policy expectations. So they are most likely to continue to maintain a highly supportive environment that will be conducive to corporate credit earnings and therefore returns in a yield seeking environment where currently government bond yields are insufficient. 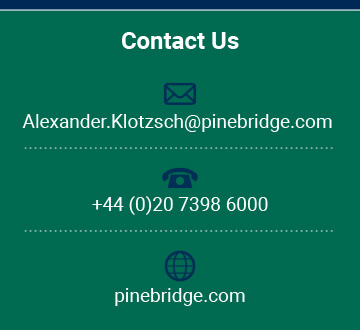 With the rebound in the credit markets, it’s difficult to find true opportunities across the entire credit spectrum, but if one looks within sectors, and we at PineBridge believe that it’s critical to focus on the fundamental outlook of each asset arena, there are superior risk-adjusted return opportunities remaining. 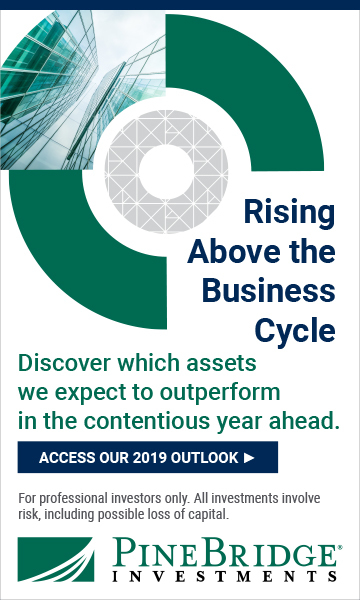 In particular, we believe that in asset classes, where the rebound has not fully materialised due to technical pressures relating to a specific asset class, that creates a value proposition. So chief among that relates to bank loans and CLO tranches which are still experiencing some technical challenges and outflows and therefore on a risk-adjusted basis they’re offering superior value. On a core longer-term fundamental outlook basis, we believe that both the economic differential outlook, as well as mechanics of what we’re seeing of the headwinds being removed by rising interest rates and the strengthening of the US dollar, will positively impact emerging market debt and emerging market credit going forward. So, as we looked out at varying fundamental outlooks, emerging markets are poised to outperform developed markets in the future, and therein lies greater opportunities within components of the emerging market debt. We continue to remain in an environment where risks are elevated from varying different factors. The primary risk arena that we currently foresee continues to relate to policy missteps and policy actions. So chief among those are central bank policies, but those risks have declined somewhat recently with their more dovish tilt overall, and of course there are multiple political risks that range from the Brexit situation to the trade barriers and the trade war escalation which is currently taking place and taking shape. But even recognising those risks remain, we believe that credit components will still offer an attractive yield return environment and we believe that, while these risks and tail scenarios are still lingering in the marketplace, that our central case is that these risks will not materialise in a manner to cause a severe negative impact overall. But when investing and when concerns around these risks must be factored into the portfolio, so we believe that one should take a more defensive approach going forward, as earnings growth have peaked, as economic growth particularly in the developed markets have also hit recent peaks overall. And so while attempting to find undervalued assets, security selection becomes a much more important factor in picking the right asset classes in an environment where we’re likely to see more periods of short-term volatility going forward will be critical to producing outsized and superior returns. Part of the challenge going forward in credit markets is the fact that valuations today have compressed to a point where we are in a coupon clipping environment and a yield clipping environment. Valuations do reflect very good conditions in the markets today, and so therefore there isn’t much in the way of capital appreciation opportunities. So investors will need to be satisfied with a coupon yield and also manage the downside risks when valuation are relatively fully valued in the environment.